If you develop a condition called pterygium, a growth that covers the white of your eye and affects your vision, you may be a good candidate for pterygium surgery. 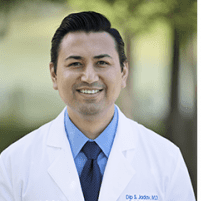 At Outlook Eye & Laser Center in Sugar Land, Texas, Dr. Dip Jadav is highly skilled in performing this type of surgery using the latest ophthalmology techniques. Schedule a consultation online or by phone to find out if pterygium surgery is right for you. The pterygium is tissue that grows on the mucous membrane that covers the white part of your eye. It can stay small or grow large enough to cover part of your cornea and affect your vision. The condition likely comes from having dry eye syndrome, from your exposure to ultraviolet (UV) light from the sun, and from wind and dust. Pterygium doesn't always cause symptoms, but if it does, they are usually mild. Symptoms can include blurred vision, redness, and eye irritation. You may also feel frequent burning or itching. If you wear contact lenses, you may not be able to wear them comfortably unless the pterygium is removed. If the pterygium grows large enough to cover the cornea and interfere with your vision, Dr. Jadav might recommend surgery. Dr. Jadav uses pterygium surgery to remove abnormal tissues from the white of your eye and your cornea. Using the latest techniques, Dr. Jadav grafts tissue from your eyelid to cover the gap left by the tissue removal. The graft requires no stitches, so you don’t have pain or eye irritation while you heal. Dr. Jadav uses a special surgical glue made from clotting proteins in your blood to hold the graft in place. What can I expect with pterygium surgery? You’re lightly sedated during the pterygium surgery, so you can relax comfortably while still being aware of your surroundings. Dr. Jadav also numbs your eye so you won’t experience any pain. Following the procedure, your eye heals quickly, and you can expect to return to your normal activities within a few days. You may feel some slight irritation and have some redness in your eye. Over the next four weeks, your eye begins to appear normal again. The adhesive Dr. Jadav uses to keep the graft in place dissolves on its own. If you’re experiencing vision loss due to pterygium, you can learn more about your surgical options by booking an appointment online or by phone.